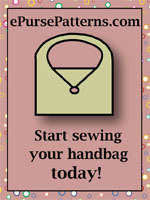 Privacy Notice : PursePatterns.com, Sew your own unique purse or bag! 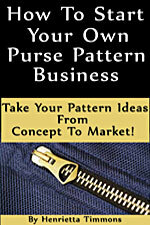 When placing an order, PuresePatterns.com collects the following information: Name, billing address, shipping address (if different), email address, and telephone number. We have a newsletter sign-up that collects your email address and your first name. The newsletter database is separate from the order processing database, and the two functions (newsletter and checkout) are independent of each other. The information you provide will not be sold, exchanged, transferred, or given to any other company for any reason whatsoever. During the checkout process, if you select the payment by credit card option, your credit card information will be securely transferred for processing using a Secure Sockets Layer (SSL) protected payment gateway with our merchant account provider. 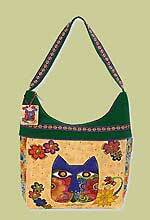 Order processing - You will receive an order confirmation email, and another email when your order is shipped. Customer Service - your information allows us to contact you if there is any issue regarding your order. If you select USPS Priority Mail as your shipping option, you will receive an email from the USPS website that provides your delivery confirmation number (USA only). If you sign up for our email newsletter, your email address is only used for the express purpose of delivering the monthly newsletter. Note: If at any time you would like to unsubscribe from receiving future email newsletters, we include detailed unsubscribe instructions at the bottom of each email. Your name, address, email address, and phone number are stored securely on our web server. Your credit card information is transmitted via Secure Socket Layer (SSL) technology and then encrypted into our secure payment gateway provider’s database only to be accessible by those authorized with special access rights (and who are required to keep the information confidential). Your credit card information is not stored in our web server database. Terms and Conditions - Please also visit our Terms and Conditions page for information on disclaimers, and the use and limitations of liability governing the use of our website.